You will be surprised by the variety of great Orlando hotels near Universal Studios that are perfect for family vacations. When you want accommodations that are a 20-minute walk, you should try the DoubleTree by Hilton at the Entrance Universal Orlando. If you are interested in onsite amenities like a huge waterpark the Coco Key Hotel and Water Resort-Orlando is superb and the SUNSOL Hotel and Resort International Drive boasts a small waterpark as well as a free shuttle. Other hotels with a free shuttle include the more upscale Point Orlando Resort and the Grand Hotel Orlando. Families who are looking to cook more should stay at the Hawthorn Suites by Wyndham Orlando International Drive, staySky Suites-I Drive Orlando or Extended Stay America-Orlando Theme Parks-Major Boulevard. 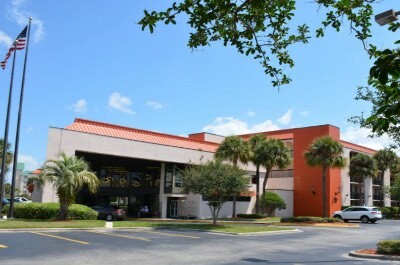 If you are searching for a basic value property then the La Quinta Inn Orlando International Drive North or Super 8 Orlando International Drive are ideal. If you are seeking a family friendly Orlando hotel near Universal Studios that features easy access to all the major attractions in Orlando, then the DoubleTree by Hilton at the Entrance to Universal Orlando is an ideal selection. Located between I-4 and Major Boulevard, the DoubleTree by Hilton at the Entrance to Universal Orlando is situated within a 20-minute walk to Universal Studios highlighted attractions like Islands of Adventure as well as the Wizarding World of Harry Potter and is a 10-minute drive to the Orange County Convention Center. The DoubleTree by Hilton at the Entrance to Universal Studio Orlando has a modern high rise architectural style with 742 rooms and suites that feature a contemporary decor. Standard guest rooms have ample size with a choice of bedding and some rooms have views of Universal Studios. Families will enjoy the two-bedroom suite for added sleeping options and views from floor to ceiling windows. The one-bedroom parlor attached suite has a separate living room with big views of the area from floor to ceiling windows. You also have an option of a Hospitality suite which can be adjoined to a standard guest room. The DoubleTree by Hilton Orlando hotel near Universal Studios has a superb spot to start your explorations of Universal Studios theme parks and you can walk or take a scheduled shuttle for a fee. Other major attractions within one mile include the Orlando International Premium Outlets for shopping, Fun Spot America and families will be thrilled with Hollywood Drive-in Golf. The DoubleTree by Hilton at the Entrance to Universal sports a freshwater swimming pool with poolside bar and a fitness center. Dining onsite includes Pompanos Restaurant for breakfast, the Lakeside Pol Bar serves light fare for lunch, the Courtyard Deli is fashioned like a food court and American Grill serves dinner. Offsite dining selections are plentiful with a short walk to Universal CityWalk with restaurants like Margaritaville as well as Hard Rock Live or you can try Miller’s Ale House, Mam Della’s serves Italian and the Cowfish Sushi Burger Bar is unique. For nightlife stay around the Universal CityWalk and you can walk to Pat O’briens Orlando or Bob Marley-A Tribute to Freedom. 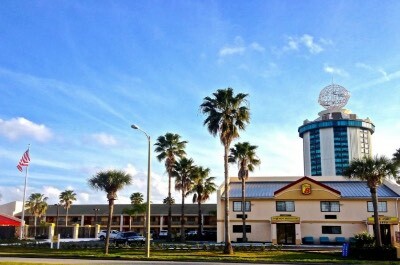 If you are seeking a family oriented Orlando hotel near Universal Studios that features plenty of unique amenities for children and adults, then the CoCo Key Hotel and Water Resort-Orlando is the best choice. 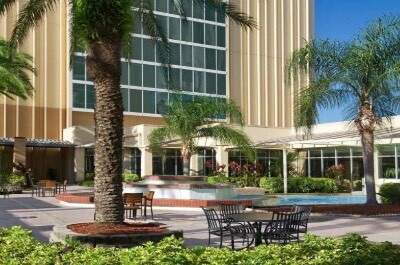 Located in the Sand Lake area between I-4 and International Drive, the Coco Key Hotel and Water Resort-Orlando is situated 2.5-miles from Universal Studios and offers a scheduled shuttle service to exciting attractions like the Wizarding World of Harry Potter and Universal Islands of Adventure as well as to SeaWorld Orlando. The CoCo Key Hotel and Waterpark Resort-Orlando has a modern two story architectural design with 391 rooms and suites which boast a bright retro beach decor. Standard rooms are sized at 264 square feet with a choice of bedding including an additional sofa sleeper instead of two beds and views of the resort or pool/waterpark area are available. Studios are sized at 400 square feet with an integrated sleeping/living area in open floorplan that includes a small kitchenette and features poolside views. The CoCo Key Orlando hotel near Universal Studios has an ideal spot for exploring Orlando with free shuttle service to Universal Studios as well as SeaWorld Orlando. You are steps away from the I-Drive Trolley that will take you places like the Titanic Experience, the Escape Game Orlando as well as Gator Golf and Adventure Park. The Coco Key Hotel and Waterpark Resort-Orlando boasts a wonderful onsite amenity with a 54,000 square foot canopied waterpark which features 14 waterslides and numerous fountains as well as play areas. Children will be thrilled with a 6,500 square feet arcade onsite and adults will like the three freshwater swimming pools which is complete with poolside service at the Wet Rooster Tiki Bar, fitness center and the free shuttle service. 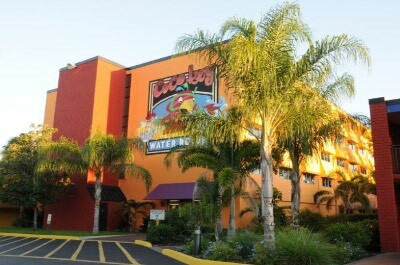 The CoCo Key Hotel and Waterpark Resort-Orlando has three restaurants onsite which include the Tradewinds Restaurant which serves breakfast, Callaloo Grille has a food court atmosphere with lunch as well as dinner offerings and there is a convenience store that boasts grab-n-go quick bites. Dining offsite within walking distance can include choices like Fresco Cucina Italiana, Seito Sushi and Ocean Prime serves seafood. Nightlife is packed with venues like Hard Rock LIveand Margaritaville at the Universal CityWalk which is only one mile away or try Sleuths Mystery Dinner Show or Nick’s Parlor Tricks. When you are searching for an all-suite family friendly Orlando hotel near Universal Studios that offers plenty of valued amenities, then the Point Orlando Resort is a perfect choice. Located in the Sand Lake area between Sand Lake road and International Drive, the Point Orlando Resort boasts a free shuttle to Universal Studios that features major attractions like Islands of Adventure and the Wizarding World of Harry Potter. The Point Orlando Resort has a modern twelve story architectural style with 215 suites which have been recently renovated with a fresh modern decor. Executive studio suites have 385 square feet of living space with an open floorplan that includes an integrated kitchenette/living and sleeping area. Double king suites are sized similar with two king beds and a kitchenette/dining area. One-bedroom grand suites are sized at 716 square feet with a separate living room, full kitchen and a balcony with views of the surrounding area. Two-bedroom family suites have 1,100 square feet of living space which is created by adjoining a one-bedroom grand suite with one of the executive studios. The two-bedroom deluxe family suite has 1,100 square of living area by combining a one-bedroom grand suite with a double studio which allows for more sleeping space. These units are perfect for oversized families that need more living space. 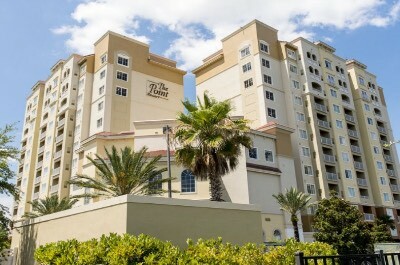 The Point Orlando Resort has a great spot to start your explorations of Orlando with several attractions within one mile of the property like Fun Spot America, Wet ‘n Wild and I Drive 360. Children will be thrilled with Kings Bowl Orlando and Lost Caverns Adventure Golf which are within walking distance. The Point Orlando hotel near Universal Studios has a freshwater swimming pool with a superb sundeck that features a poolside bar and grill, concierge services, fitness center and a free shuttle to surround attractions. Dining onsite includes Barista for breakfast, the New Evo Lounge and Tapas Bar serves early dinner into the night and the poolside Cabana Bar and Grill serves light fare for lunch as well as dinner. Offsite dining selections within a short walk or drive include a number of chain-style restaurants or you can try Ana’s Kichen for Brazilian, Charley’s Steak House and Giordano’s prepares Italian including pizza. Nightlife can be found one mile away at Universal CityWalk and within walking distance you will find the Zaman Hookah Lounge and Mama’s Comedy Show. If you are interested in an Orlando hotel near Universal Studios that is family friendly with all-suites and is value oriented, then the Hawthorn Suites by Wyndham Orlando International Drive is a superb selection. Located in the Sand Lake area just off International Drive and 1.5-miles south of Universal Studios, the Hawthorn Suites by Wyndham Orlando International Drive is situated within walking distance to many attractions including Madame Tussauds Orlando, Ripley’s Believe It or Not? and the Titanic Experience. The Hawthorn Suites by Wyndham Orlando International Drive is a collection of modern two story buildings that contain 176 suites that are furnished with a modern contemporary decor. Studio suites are sized at 458 square feet with a choice of bedding, an integrated living/sleeping area, separate dining room, full kitchen, fireplace and views of the property. Two-bedroom suites have 740 square feet over two-levels of living space with three beds, an integrated living/dining area, full kitchen, 1-bathroom and views of the property. 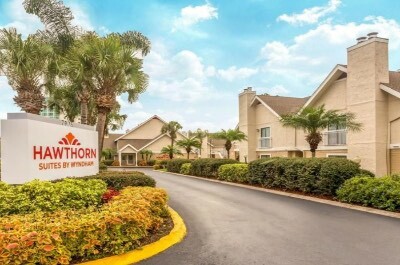 The Hawthorn Suites by Wyndham Orlando hotel near Universal Studios offers a free shuttle to area attractions including the properties at Universal Studios which include the Wizarding World of Harry Potter and Universal Islands of Adventure. Other major attractions nearby within a 1-mile are the Escape Game Orlando, SKELETONS: Museum of Osteology and iFLY Orlando. Children will enjoy Arcade City, SEA LIFE Aquarium as well as Gator Golf and Adventure Park. The Hawthorn Suites by Wyndham Orlando International Drive has a freshwater swimming pool with sundeck, barbeque area, activity courts and a fitness center. Dining includes a complimentary breakfast and a leisurely cooked in-room meal. Offsite dining selections that are within walking distances are Kings Orlando Restaurant for pizza, Chuy’s prepares Mexican dishes and LongHorn Steakhouse. Nightlife is an easy walk with Mango’s Tropical Café, Camelot Knights Dinner Adventure and Tournament as well as Murphy’s Arm Pub. 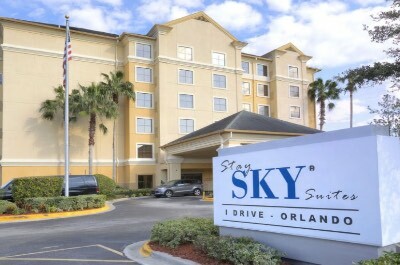 When you are searching for a family friendly all-suite style Orlando hotel near Universal Studios, then you need to stay at the staySky Suites-I Drive Orlando. Located in the Sand Lake area just one mile south of Universal Studios, the staySky Suites-I Drive Orlando is situated less than a 5-minute drive to all the attractions at Universal Studios and the Orange County Convention Center is less than a 30-minute walk. The staySky Suites-I Drive Orlando has a modern six story architectural design with130 rooms and suites that boast a modern decor. Executive rooms are nicely sized with a king size bed and view of the surrounding area. One-bedroom suites are sized at 545 square feet with a choice of bedding, full kitchen, a separate living room and views of the city or pool area. Two-bedroom suites are created by adjoining an executive room with a one-bedroom suite for more living space and sleeping options. The staySKy Suites-I Drive Orlando has a perfect spot for you to begin your adventures of the area with an easy drive of less than one mile to Universal Studios, the Wizarding World of Harry Potter and Universal Island of Adventure. Other major attractions within walking distance are Ripley’s Believe It or Not!, I-Drive 360 and the Titanic Experience. The staySKy Suites Orlando hotel near Universal Studios has a freshwater swimming pool with a nice sundeck area, fitness center and an arcade room onsite. Dining at staySky Suites-I Drive Orlando starts with a complimentary breakfast and finishes with dinner at the Market Place. Offsite selections are numerous with several chain style restaurants at the CityWalk and along International Drive you will find FishBones, Ana’s Kitchen prepares Latin dishes and Cooper’s Hawk Winery and Restaurant serves American style cuisine. Nightlife is easy with Universal CityWalk where you will find a plethora of entertainment choices. Within walking distance the property you will find the Pirate’s Dinner Adventure, Nick’s Parlor Tricks and Kings Bowl Orlando is a fun place for children as well as adults. If you want a mid-range family friendly Orlando hotel near Universal Studios that puts you right in the middle of the action then you should try the a Quinta Inn Orlando International Drive North. Located in the Sand Lake area less than one mile south of Universal Studios, La Quinta Inn Orlando International Drive North is within a 30-minute walk to many of the exciting attractions including Universal’s Islands of Adventure. La Quinta Inn Orlando International Drive North has a modern two story architectural style with 156 rooms and suites that feature a fresh modern decor. Standard rooms range in size from 205 to 215 square feet with a choice of bedding, microwave and refrigerator (small kitchenette) and views of the surrounding area. Studios are slightly bigger with a sofa sleeper, small kitchenette and views of the surrounding area. There are no balconies at this hotel. 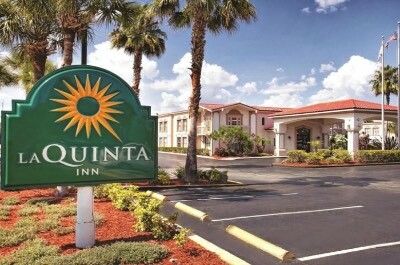 The La Quinta Inn Orlando hotel near Universal Studios is ideally situated within one mile to the Wizarding World of Harry Potter, Universal Studios and Universal Islands of Adventure. 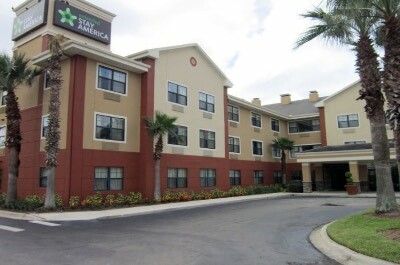 You are within walking distance to Fun Spot, the Orlando International Premium Outlets and Lost Cavern Adventure Golf. Dining onsite includes a free breakfast daily with numerous offsite restaurants within walking distance including chains like Margaritaville, Hard Rock LIveand Red Lobster. If you want something different try Amor Em Pedacos Bakery for Latin, Jake’s American Bar and Grill as well as the Cowfish Sushi Burger Bar. Nightlife options within walking distance can include Treasure Tavern Dinner Theatre, the Cirque Magique and there is plenty of entertainment in the evening at Universal CityWalk. When you are seeking a mid-range Orlando hotel near Universal Studios that is ideal for families then you should stay at the SUNSOL Hotel and Resort International Drive. Located in the Sand Lake area just one mile south of Universal Studios, the SUNSOL Hotel and Resort International Drive is situated on manicured grounds and is one block away from International Drive where you will find a variety of shopping as well as entertainment venues. SUNSOL Hotel and Resort International Drive has a modern four story architectural style with 192 rooms that sport a fresh modern decor. Rooms are sized between 214 to 255 square feet with a choice of bedding, microwave and refrigerator (small kitchenette) and views of the pool as well as surrounding area. Additional rooms with a similar size are available with a sofa sleeper and king size bed. There are no balconies. The SUNSOL Hotel and Resort International Drive offers a free shuttle to Universal Studios, Universal Islands of Adventure and the Epcot Center. Other attractions within one mile include the Wizarding World of Harry Potter, I-Drive NASCAR Indoor Kart Racing, Congo River Golf and SeaWorld Orlando is 4-miles away. The SUNSOL Orlando hotel near Universal Studios has an excellent freshwater swimming pool with a children’s Splash Park playground that features fountains and there is not a fitness center onsite. Dining options include a complimentary continental breakfast and there is a snack bar onsite that features light fare for all three meals. Dining options are plentiful within the Universal CityWalk with several chain oriented restaurants as well as Vivo Italian Kitchen, Has House A Go Go and the Kitchen prepares American dishes. Nightlife within walking distance could include Wantilan Luau, the Pirate’s Dinner Adventure or a stop at Backstage Billiards. If you are seeking an affordable all-suite Orlando hotel near Universal Studios that is perfect for families and all types of travelers, then the Extended Stay America-Orlando Theme Parks-Major Boulevard is a great place to stay. Located between Florida Turnpike and Universal Studios, the Extended Stay America-Orlando Theme Parks-Major Boulevard is situated within one mile or a 30-minute walk to Universal’s Islands Adventure, Wizarding World of Harry Potter and Universal Studios Orlando. The Extended Stay America-Orlando Theme Parks-Major Boulevard has a modern three story architectural design with 121 studio suites that feature a contemporary decor. Studio suites have 301 square feet with a choice of bedding, a full kitchen, integrated living/sleeping area and a view of the surrounding area. Studios do not boast balconies. The Extended Stay America-Orlando theme Parks-Major Boulevard is a great place to start you adventures with easy access to the theme parks of Universal Studios and you are within a short 15-minute walk to the Orlando International Premium Outlets for shopping. Other attractions like International Drive, Wet ‘n Wild, the Coca-Cola Orlando Eye and Hollywood Drive-in Golf will require a short drive of less than 4-miles. The Extended Stay America Orlando hotel near Universal Studios has a freshwater swimming pool as well as a fitness center onsite. You will enjoy the free grab-n-go breakfast in the morning and you can cook a leisurely in-room meal with your full kitchen. Dining options are numerous with several chain restaurants nearby and within walking distance to the hotel include Miller’s Ale House, Mama Della’s serves Italian as well as Border Grill Fresh-Mex. Nightlife within one mile is plentiful with the Universal CityWalk, the Blue Man Group and Bob Marley-A Tribute to Freedom. When you want a value oriented Orlando hotel near Universal Studios that is superb for all types of travelers and offers a multitude of amenities, then the Grand Hotel Orlando is an ideal choice. Located less than 2-miles south of Universal Studios, the Grand Hotel is situated in a manicured garden and is within walking distance to International Drive and the Convention Center. The Grand Hotel has a modern four story architectural style that features 334 rooms and suites which have been recently renovated with a modern decor. Guest rooms are sized at 400 square feet with a choice of bedding with no balconies and views of the grounds or surrounding area. The Grand Hotel Orlando is ideal place to start your explorations of the area with many well-known attractions within a short distance. Attractions you can visit within walking distance include places like the Sea Life Orlando Aquarium, the Escape Game Orlando and children will enjoy Arcade City as well as Kings Bowl Orlando. The Grand Hotel Orlando boasts a free shuttle to Universal Studios, Universal Islands of Adventure, the Wizarding World of Harry Potter and to Sea World Orlando as well as Walt Disney World Resorts. You are also within one mile to iFly, Fun Spot America as well as Ripley’s Believe It or Not! Orlando. The Grand Hotel Orlando near Universal Studioshas a recently renovated Olympic size freshwater swimming with a sundeck within a garden area and children will like the splash play area. There is a fitness center and game room onsite. Dining at the Grand Hotel Orlando includes a complimentary breakfast daily but no restaurant onsite. Dining options are numerous within walking distance with choices like FishBones for seafood, Kings Orlando Restaurant serves American cuisine and Charley’s Steak House prepares steaks. Nightlife is plentiful within walking distance with Mama’s Comedy Show, Nick’s Parlor Tricks and Sleuths Mystery Dinner Shows. When you are searching for a value oriented Orlando hotel near Universal Studios Orlando that is great for families and provides easy access to several attractions then the Super 8 Orlando International Drive is a perfect selection. Located off of I-4 in Sand Lake just south of Universal Studios Orlando, the Super 8 Orlando International Drive is an easy 5-minute drive to many major attractions such as Universal CityWalk and the Wizarding World of Harry Potter. The Super 8 Orlando International Drive has a modern two story architectural design with 110 rooms that feature a bright contemporary decor. Rooms have ample living space with a choice of bedding, a microwave, mini-refrigerator, coffee maker (small kitchenette) and view of the surrounding area. The Super 8 Orlando International Drive has a great spot for exploring this area of Orlando. The Super 8 Orlando International Drive is less than 2-miles from Universal Studios Orlando, Universal’s Islands of Adventure and the hotel is within an easy 15-minute walk to attractions like Fun Spot America as well as Wet ‘n Wild. Children will like the short walk to Congo River Golf, the Outer Limitz Trampoline Arena and Lost Cavern Adventure Golf. 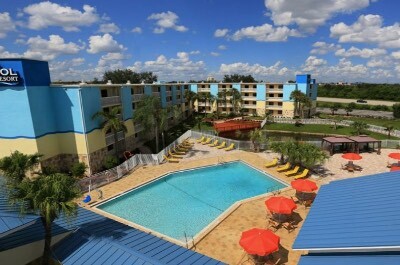 The Super 8 Orlando International Drive has a freshwater swimming pool with a sundeck and a fitness center onsite. An added bonus is a free breakfast daily but there is no restaurant onsite. There are numerous dining selections offsite within walking distance that include several chain style establishments, Camila’s Restaurant for Latin, Jake’s American Bar and Grill as well as Vivo Italian Kitchen. Nightlife at this Orlando hotel near Universal Studios could include the Blue Man Group, Treasure Tavern Dinner Theatre and the Cirque Magique which are all within an easy walk or drive.